The main concern in any stairway is “Safety before Beauty”. But remember! As much as stairs have to be functional and safe, stairs can be very decorative and an impressive part of your home. Mares & Dow Construction can build both a safe and beautiful stairway for you. 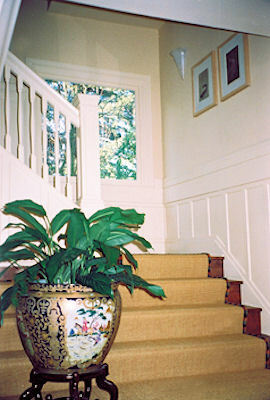 Mares & Dow has repaired and built hundreds of stairways over the past 32 years. A lot of different repairs go into making an old set of stairs safe. In the early 50’s to 70’s a lot of stairways were built that are not up to the safety codes we have proven to be safe today. The most common repairs are correcting the rise height, tread depth, slope or pitch, landings, headroom, width, walkline, slippery steps, lighting, banisters and most of all handrails. Mares & Dow Construction has helped a lot of homeowners over the years make that little triangular, raw, blank space under the stairs to good use. We have created good storage space with drawers, cubbies, storage cabinets, a closet with mirror doors. Or we have created little living areas like a window seat with a cushion, an open area with carpet and a motion detector light for the kids to play or store toys, or a little area for a desk and computer, or a place to show off your wine collection-a beautiful wine rack.